— Beautiful permeable patio and outdoor kitchen project in Circle C Ranch. 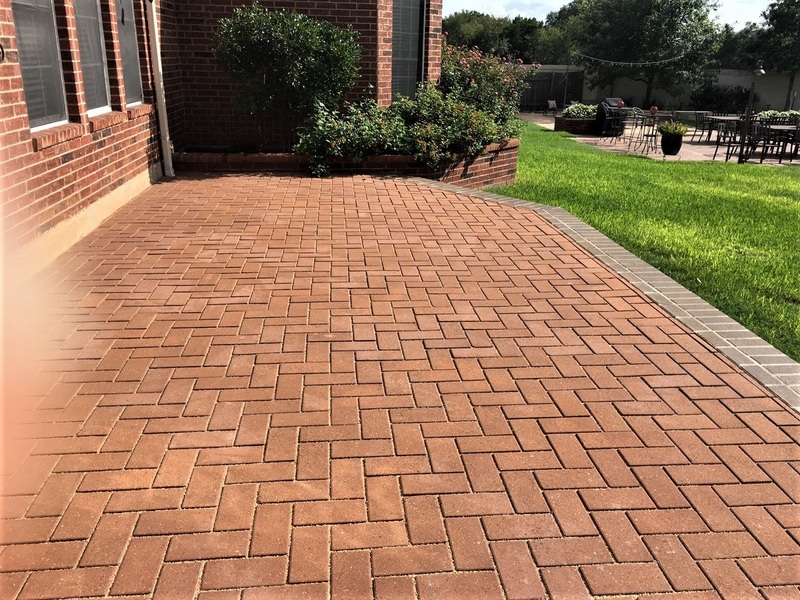 If you need a permeable patio for your Austin-area backyard, patio builder of Austin will design and build the perfect permeable patio for your home. Today we are looking at a project where the homeowners wanted a new raised patio area with a retractable awning so they could shade the patio when they needed to. They specifically wanted the project to include a permeable paver patio system and an outdoor kitchen. — Circle C Ranch backyard before Archadeck of Austin began the project. Archadeck of Austin has designed and built permeable patios in the past, and each one is unique based on the setting and the homeowners’ preferences. The objective is to provide sufficient drainage for water to run off of the pavers and into the ground. Ultimately this drainage enables water to find its way to the natural aquifers in and around Austin. Drop by drop: Why choose a permeable patio? • The community as a whole benefit from stormwater being directed back into the local groundwater supply. • The permeable patio system acts as a filter for improving local water quality. • In dry areas, these permeable patio systems can reduce erosion. 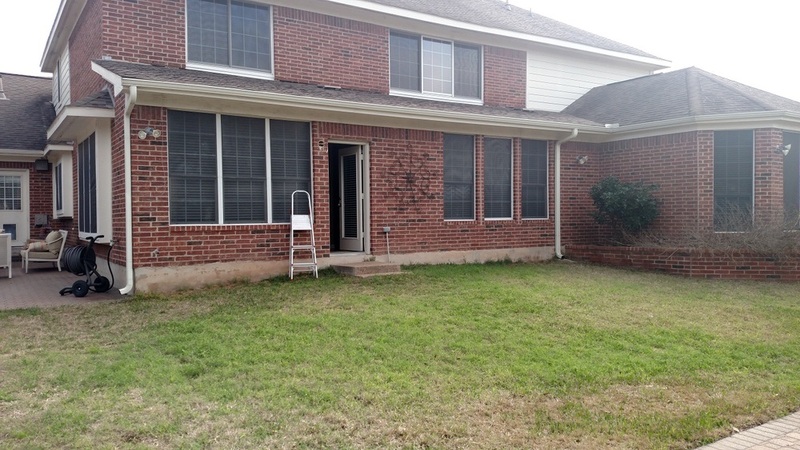 • When you get rid of standing water on a patio, you minimize opportunities for mold and algae to grow, and you reduce areas in which mosquitoes can breed. • Homeowners will need to use less water for landscaping than they would if they had a traditional patio. To frame the patio area, we first built the steps that would lead down from the raised patio to the yard. This is a low stair system with just two steps that extend the full width of the patio. We built the stairs with concrete and then used mortar to attach pavers to each step. To install the permeable patio system, we set down a 2-3 inch layer of rock filling the space between the stairs and the house. We covered the rocks with a ¾ inch layer of limestone gravel. The next layer was sand. Finally we topped it off with Belgard patio pavers, which we laid in a classic herringbone design. We filled the gaps between the pavers with sand. Water will run off of the pavers, through the sand, gravel and rock and ultimately to the aquifer. Meanwhile, the patio surface provides a smooth texture on which to walk. You’ll notice that the pavers on the stairs contrast in color with those on the patio surface. This design provides an attractive border for the patio while also indicating the patio’s edge so people will notice when they are about to take a step down! For safety at night, we installed tiny LED spotlights on the face of the stair risers’ Belgard Holland stone pavers. Overall the project blends nicely with the back of the house. 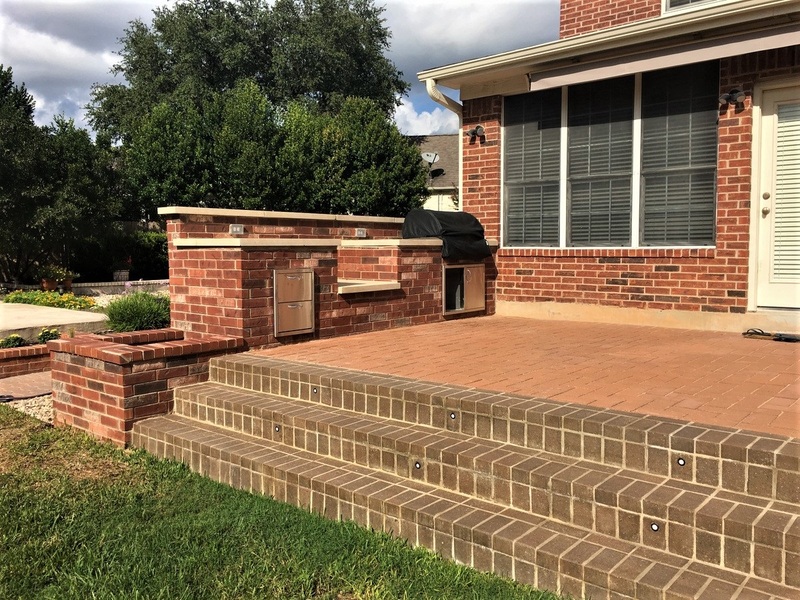 We worked to select patio pavers that would complement the brick home, and we built the outdoor kitchen with brick. 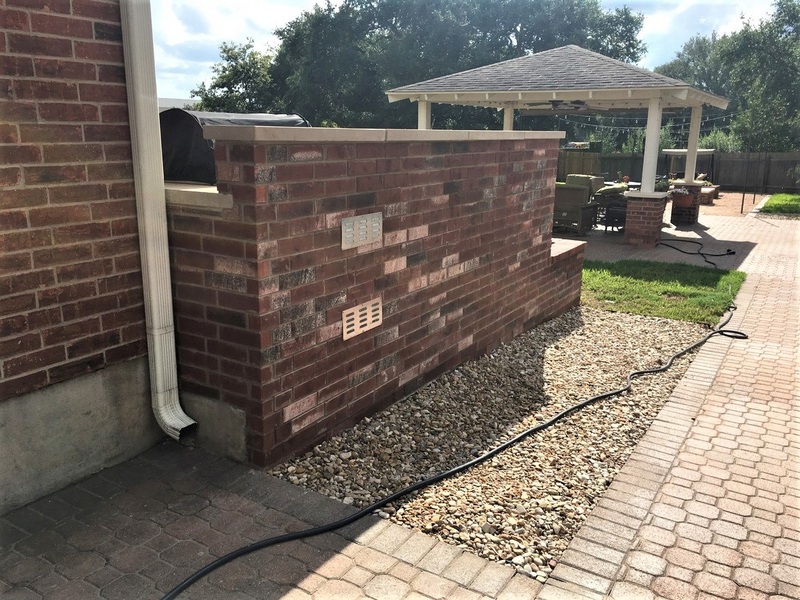 It was important to match the brick of the outdoor kitchen with the home’s original brick, which had been discontinued. Luckily, the homeowner had about 100 of the original bricks, so we matched these as closely as we could and mixed the new bricks in with the original. 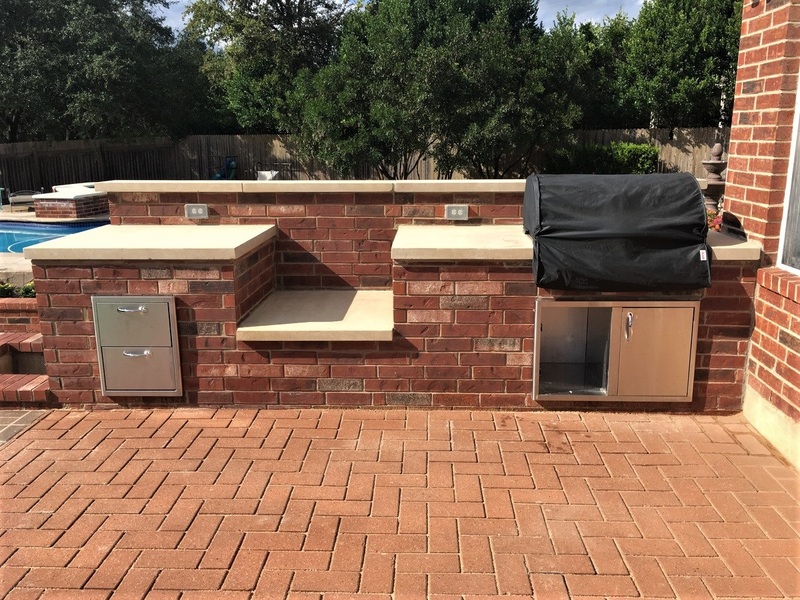 The outdoor kitchen extends from the house to the steps providing plenty of room for a gas grill, the clients’ Big Green Egg smoker and a built-in brick planter box. We also included smooth stone kitchen countertops for workspace on either side of the smoker. Archadeck of Austin handled the electrical work for the outdoor kitchen and wiring for the LED stair lights. These Circle C Ranch homeowners love the beauty of their new herringbone patio. 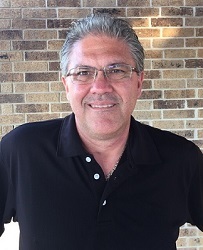 They also love the fact that they found just the right patio builder, Archadeck of Austin, to design and build their permeable patio. 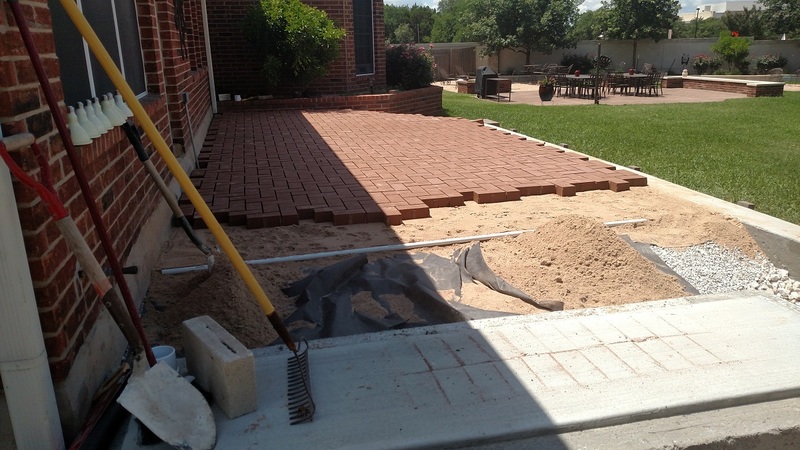 Are you interested in adding a permeable patio to your home’s outdoor living space? 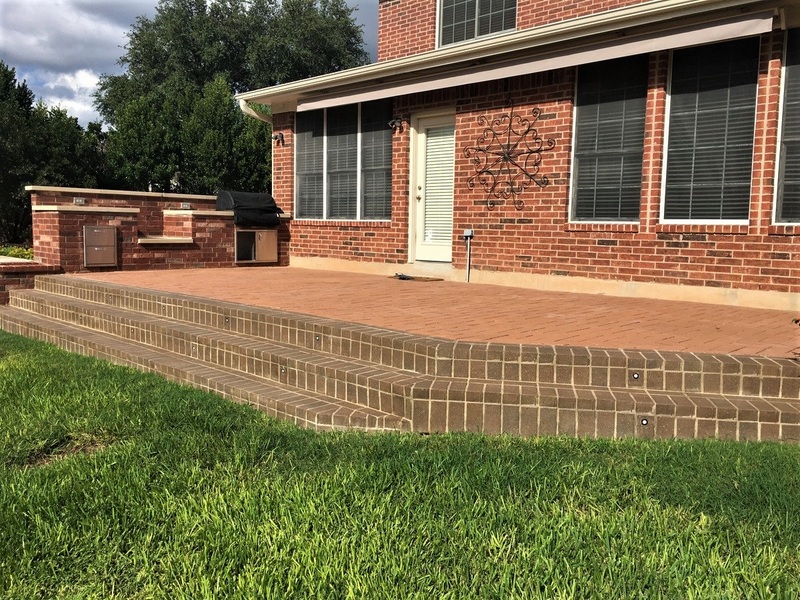 For this or any other patio design and installation, call Archadeck of Austin today at 512-259-8282 or email us to schedule your free design consultation.